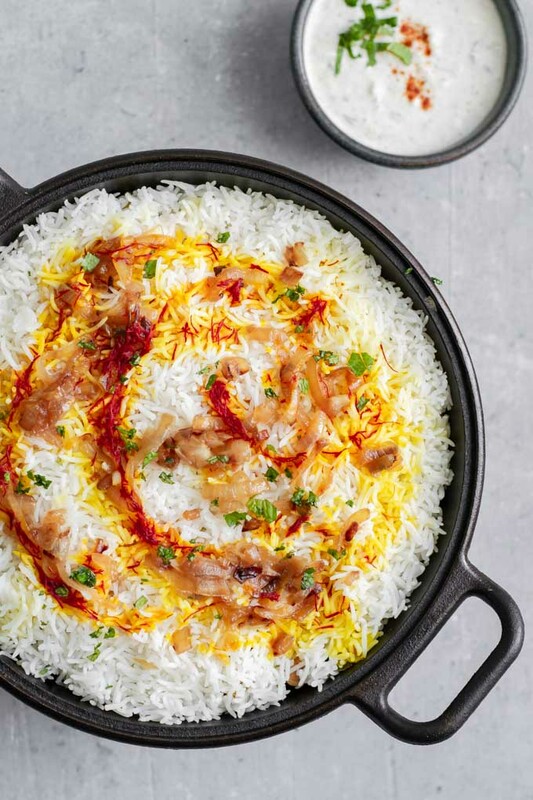 When it comes to Indian food, Biryani is in a class of it’s own. 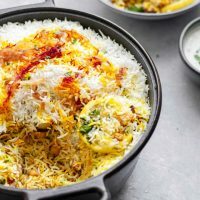 A spicy curry marinated filling, saffron kissed rice, fried potatoes, toasted nuts, and fragrant herbs come together in layers to make something so special it’s been named the food of the gods. With this recipe I’m bringing you a version from my own heritage, Sindhi vegetable biryani. I will admit right here that biryani is not the simplest recipe. 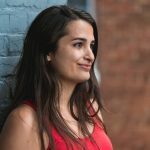 There’s a long list of ingredients (which I’ve done my best to refine for you), and there are multiple components to it. But it’s also not a difficult recipe to make, and it makes a lot of food. 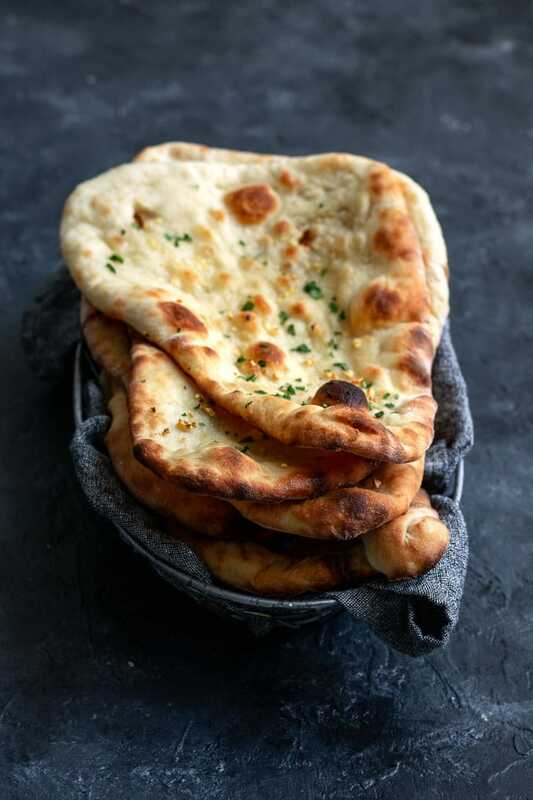 It’s also a complete meal–while it can accompany other dishes, it’s meant to stand on its own. Well, I say on its own, but really it should be served with vegan raita. A spiced and herbed creamy yogurt sauce, it’s the perfect tangy, cooling accompaniment for biryani. There are many kinds of biryani out there, with different regions making claim to variations on the dish. I’m Sindhi, so making a vegan version of the famous Sindhi biryani was a must do. 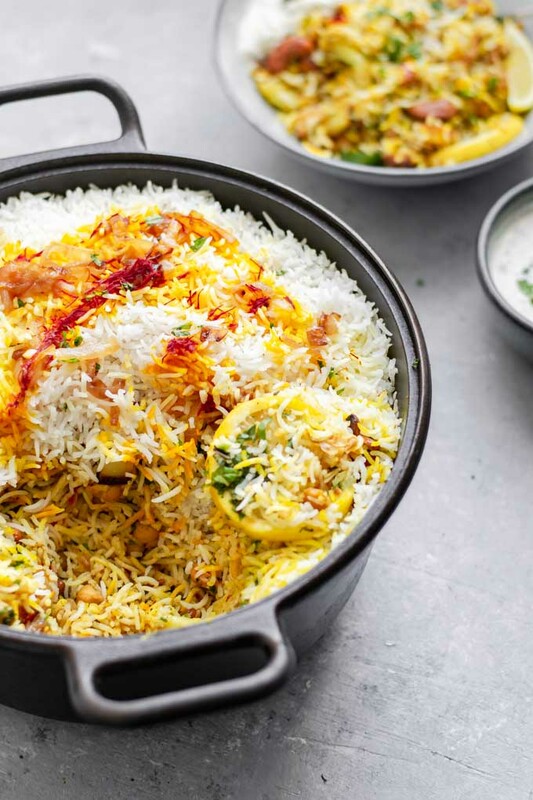 While a lot of Sindhis are vegetarian, Sindhi biryani is commonly found with [goat] meat. But making a vegetable version is easy. I use a mixture of chickpeas and cauliflower instead of the meat, and this means you get your protein and your veggies aka a win-win! For those unfamiliar with biryani, I’ll give a quick run through. And while there are different kinds of biryani there are some unifying themes. It’s could be described as a layered rice casserole. 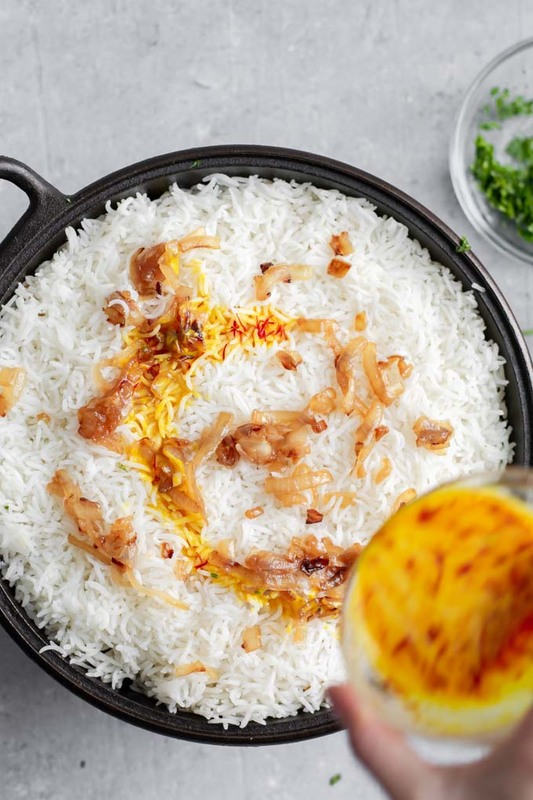 The rice is basmati, a fragrant, fluffy, and non-sticky long grain. Typically white rice is used, but brown could be substituted with some changes to cooking length. Next we have the curry layer, consisting of a curry-yogurt marinated protein (and/or vegetable). Then we have the fried potato layer and the fried onion layer. Mint and cilantro are their own very important layer, as are roasted cashews. Then, we have a layer of thinly sliced lemons. These are optional, if you’d prefer you can just squeeze lemon juice on at the end to serve. To finish the dish, a drizzle of saffron infused [plant] milk tops the rice. The saffron soaks into some of the kernels of rice in the top layer, making for a gorgeous golden hue staining some of the rice and adding a floral/earthy/almost indescribable essence that is saffron. The first step of the rice layer is preparing the saffron. Saffron can be soaked in warm water or milk (I choose a non dairy milk) to release its color and scent. Combine the saffron and plant milk in a small dish and let sit until you’re ready to use it 30+ minutes later. Next, soak the basmati rice for 20-30 minutes. I use this time to prepare the other components of the recipe. Rinse the soaked rice really well, then cook it in a lot of salted boiling water, similarly to how pasta is cooked, until the rice is about 3/4 of the way cooked. This only takes 5-7 minutes for white rice. Then drain the rice and set it aside. The curry layer is the most complex of the layers. It starts with a curry marinated protein (and/or vegetable), which is then cooked up with onion, garlic, ginger, chiles and tomato. You get a flavorful, saucy, and delicious meal. I like to use plain and unsweetened coconut yogurt as the mild coconut flavor pairs well with Indian cuisine, but any plant based plain yogurt will work. The yogurt is mixed with spices, and this is where I take some liberties and short cuts. If you live near an Indian grocery store you will be able to find spice mixes for different kinds of biryani and feel free to pick that up (the Sindhi biryani mix if possible of course! ), just be careful because these spice mixes can be very spicy. Other recipes will have you make your own spice mixes from whole spices, which is extra special and delicious no doubt, but trying to keep this recipe accessible I take advantage of garam masala (and a lot of it) so that the spice list is just 3 ingredients long! Garam masala is a spice blend and it varies from region to region and brand to brand, but what they do always have in common is that they’re darn delicious! And easy to find everywhere Indian cuisine is popular. I top off the garam masala with an almost equal amount of ground coriander, some ground turmeric, and cayenne. 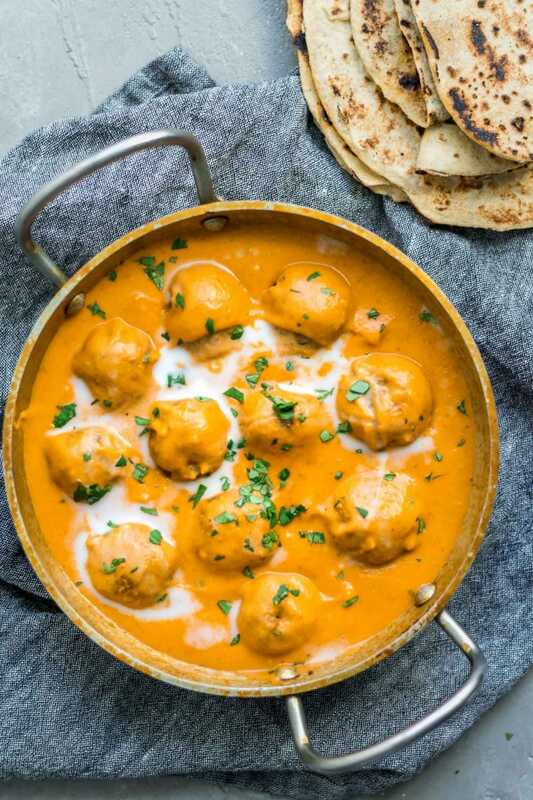 Chickpeas and cauliflower are marinated in this curry-spiced yogurt. It can be mixed together right before cooking, or put together in advance, keeping in the fridge if far enough in advance. To cook, first we fry up onions, then remove some of those to reserve for the fried onion layer. While some recipes might deep fry the onions until crispy, I like sautéing them to lightly caramelize. To the rest of the onions we add garlic, ginger, and chiles and let those fry for a minute before adding chopped tomatoes. 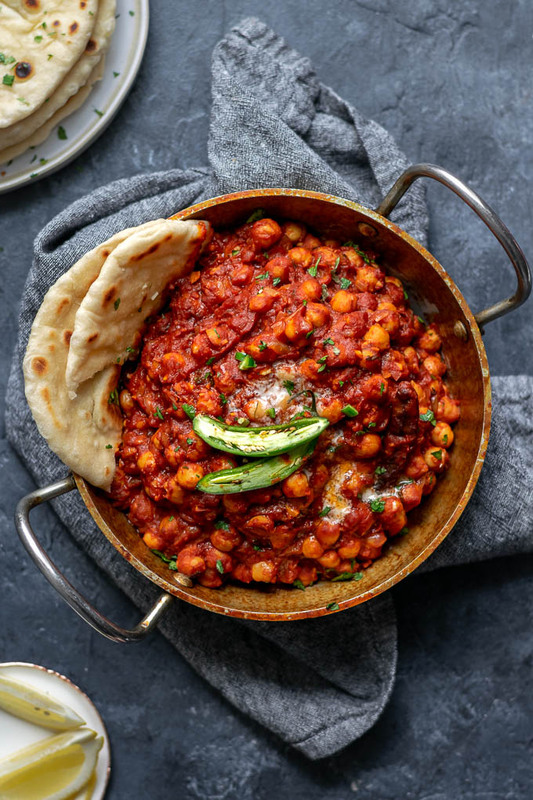 Cook until the tomatoes are saucy, just a few minutes, then add the yogurt marinated chickpeas and cauliflower. Cover and let those cook until the cauliflower is just tender. You don’t want to overcook it at this point since it’ll get cooked further once everything is put together. The potatoes actually get fried between whipping together the curry-yogurt marinated chickpeas and cauliflower and cooking the onion. I mean, you could cook them separately but I like to minimize dishes and oil used, so fry the potatoes before I fry the onions. For the potatoes, just pan fry them with oil and a bit of salt until they are golden and fork tender. Remove them from the oil and set aside until ready to use! Chop up your mint and cilantro, and roast your cashews. Slice up the lemon. Then gather everything mis en place. Grab a large casserole dish or dutch oven. Bonus points if it has a heavy lid! 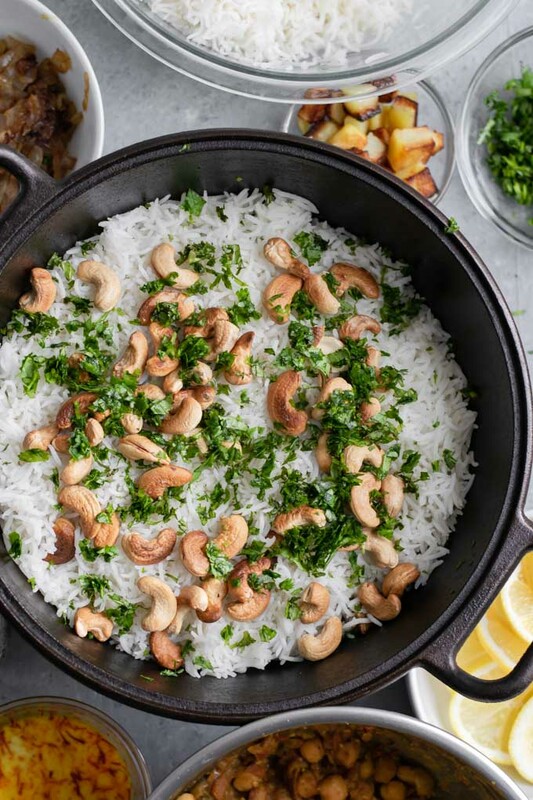 Then gather around the par-cooked rice, the curry, the potatoes, the fried onion, the roasted cashews, the sliced lemon, and the chopped mint and cilantro. And lastly, drizzle over the saffron infused [plant] milk. Put the lid over the top, if it’s not a heavy lid then first put a layer of aluminum foil over before the lid. Stick the pot over the burner and let everything steam gently for 15-20 minutes. The rice should be fully cooked at this point! 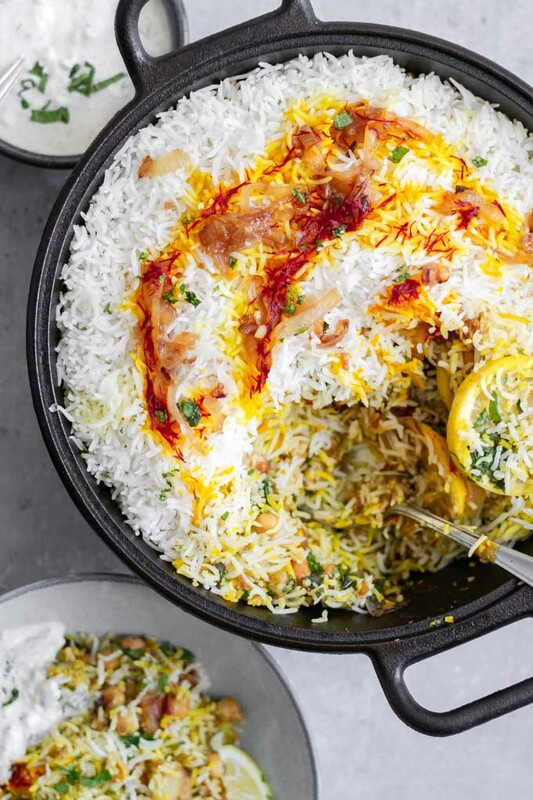 Serve the biryani with plenty of vegan raita, and squeeze extra lemon juice on each serving. This is a special dish, perfect for serving to guests or loved ones. I hope you give it a try as it’s so delicious and delightful to eat! If you make this vegan Sindhi vegetable biryani, leave a comment below and rate the recipe on the recipe card. And please share your photos with me on Instagram, tag @thecuriouschickpea and #thecuriouschickpea, I love seeing your creations! 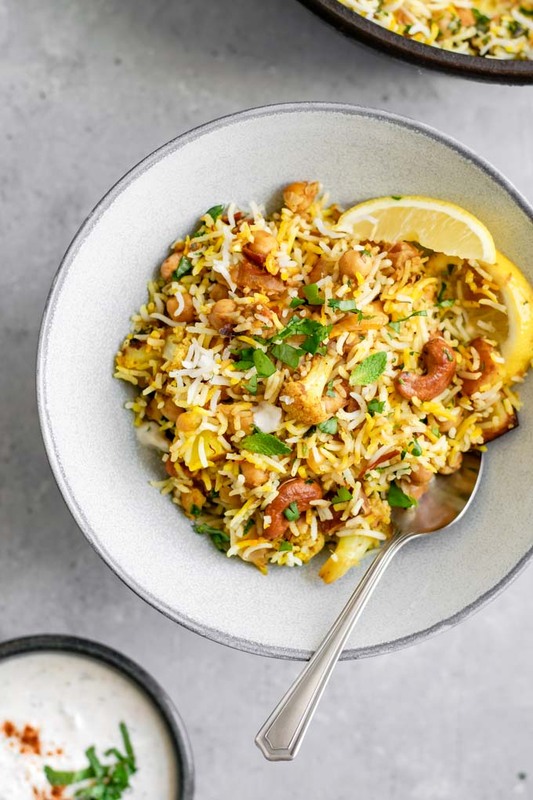 This Sindhi vegetable biryani is a popular and traditional dish, with layers of spiced vegetables and chickpeas and basmati rice. It's said that biryani is the food of the gods, and it's easy to understand why when you eat this delicious recipe! In a small dish add the saffron, crumbling slightly, and the warm plant milk. Set aside to at the end. Soak the basmati rice in plenty of cold water for 20-30 minutes. Drain and rinse thoroughly. Bring a pot of 12 cups of water and 2 tbsp salt to a boil then add the soaked rice. Cook until the rice is about 3/4 of the way done, about 5-7 minutes. Drain the rice and set aside. While the rice is soaking continue with recipe. First, prepare the marinade: In a mixing bowl whisk together the yogurt, garam masala, coriander, turmeric, and salt. Add the chickpeas and cauliflower and set aside. Heat 1/4 cup of oil over medium heat in a skillet. When hot, fry the potatoes with 1/4 teaspoon of salt until they are golden and tender, about 6-8 minutes. Remove the potatoes and set aside. Add 2 tablespoons of oil to the pan along with the onions and 1/4 teaspoon of salt. Sauté the onions over medium-low to medium heat until they are golden and lightly caramelized, about 20 minutes. Remove about 1/4 of the onions, reserving for later, and to the pan add the ginger, garlic, and chili. Fry for 1 minute. Add the tomatoes and cook until they have broken down and turned saucy, about 5 minutes. Add the chickpea and cauliflower mixture, stirring to combine. Cover and cook until the cauliflower is just tender, about 10 minutes. 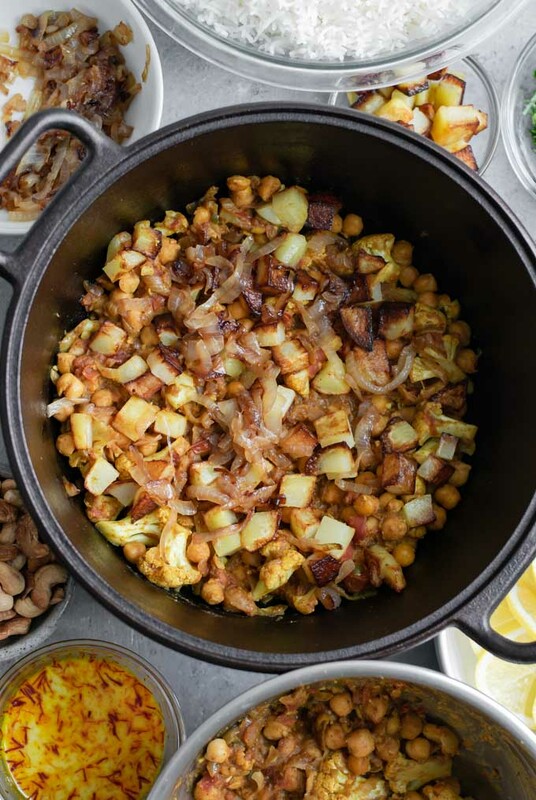 Layer the biryani: In a large dutch oven (at least 4-quart) layer half of the curried chickpea and cauliflower mixture, followed by half of the potatoes, then about 1/3 of the reserved fried onions, then half of the rice, and lastly the all of the roasted cashews and the cilantro and mint. If using, add a layer of lemon slices. Repeat the layers, using the second half of the curried vegetables, then the rest of the potatoes and most of the onions, and the remaining rice. Add the last of the fried onions to top the rice, then give the saffron milk mixture a stir before drizzling over the rice. Place a heavy lid on top (if the lid is not heavy, first seal with aluminum foil then place the lid on). Heat the pot over low heat for 15-20 minutes to finish cooking the rice and combine the flavors. If the pot is heavy like my cast iron pot, first heat over medium-high heat for a few minutes, then turn the heat to low to continue steaming. Serve garnished with more cilantro and mint, lemon wedges, and vegan raita. A friend gave me saffron powder from his visit to Sri Lanka, do you think I could sub it for saffron threads here? Hi Erica, I would definitely substitute the saffron powder! What a special gift ☺️. Some recipes skip the saffron and use yellow food coloring but I think the saffron adds that last special touch of flavor. Should I still use the milk with the powder? Is the milk needed to help steam the rice or just to release the saffron? Yes, still use the milk (hot water works as well). The liquid is for releasing the color and flavor of saffron!